Last week Jack brought home a plant pot from Beavers. In it was some soil, and a bean which he had planted himself. We have been charged with caring for this bean and helping it to grow. This will go towards his Gardening Activity badge. He also needs to take photos of his bean growing, which will contribute to his Photographer Activity badge. If the Beavers manage to successfully grow their beans (they are Broad Beans so fingers crossed they will grow well) they will then harvest them and cook them! Guess which badge that will be part of... The Cook Activity! So given how many badges this little pot of dirt is worth it has become a very precious little pot of dirt. Jack, being Jack, has needed reminding to check on his bean on a daily basis. A plant pot with nothing showing isn't very interesting to a 7 year old with a short attention span. Me and Hubby have kept a close eye on it. I've been scared that it wouldn't grow (I don't have a good track record with plants) and handled it very very carefully, dreading being the reason Jack's bean snuffed it! 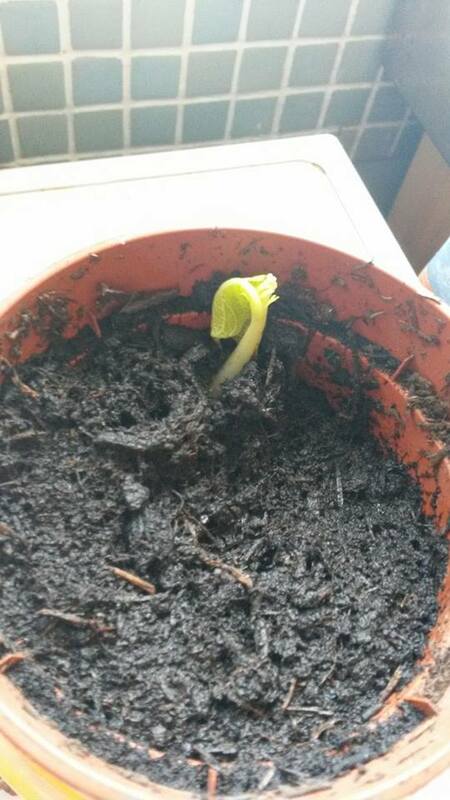 But then, suddenly, today... 11 days after they planted their beans and took them home... we have a sprout! And instantly it has become very very interesting! I've been looking up Broad Bean care to help him along with his growing too. RHS have a nice little page on growing Broad Beans with kids. I've learned as much as Jack! Watch out for our #BeanWatch Tweets, Instagrams, & FB posts!